AMD shared its 5 year long GPU and APU roadmap with the world for the first time during the PC Cluster Consortium event in Osaka Japan. 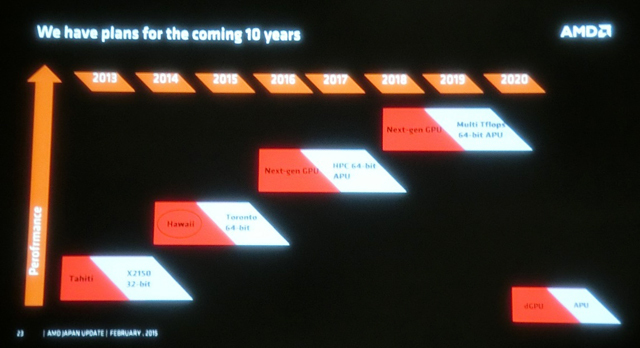 During the event AMD’s Junji Hayashi took the stage to reveal what AMD has got in the works for the next five years. The discussion revolved around AMD’s graphics IP and all the products that involve it. Including discrete Radeon graphics cards and Radeon powered Accelerated Processing Units or APUs for short. As well as AMD’s upcoming ARM ( K12 ) and its sister x86 CPU core ( Zen ) . In addition to AMD’s ambidextrous strategy to develop and introduce both x86 and ARM powered SOCs to the market in a pin for pin compatible platform code named SkyBridge. As you’ve come to know by now AMD is planning to introduce two brand new CPU cores into the market next year. Both are 64bit capable parts but one is based on the ARMv8 architecture while the other is based on the more traditional x86 AMD64 architecture. The cores will target the server, embedded, semi-custom and client markets. Both cores will debut inside 14nm FinFET products ( CPUs and APUs ). If you’re in the know then so far you’ve learned nothing particularly new. The new information that has been revealed this time around is that the K12 and x86 sister core will support “many threads”. It was speculated and rumored before that AMD’s upcoming x86 and ARM CPU cores will support simultaneous multi-threading instead of clustered multi-threading which is what AMD’s current Bulldozer family (Piledriver, Steamroller and Excavator) of processors support. Simultaneous Multi-Threading or SMT for short is often leveraged in large CPU cores to opportunistically take advantage of the various resources in the core which are underutilized and dedicate them to an additional, slower, execution thread for added throughput. This adds to the area efficiency of the core design and reduces the effect of stalls and pipeline back pressure leading to improved resource utilization inside the core which in turn improves overall performance. In contrast, clustered multi-threading works by looking for opportunities to share resources between two different CPU cores, instead of doing it inside a single CPU core. The upside is savings in power and chip area by use of fewer transistors. So essentially with SMT the net result is one super fast thread and an additional much slower thread. While the CMT you get two equally and moderately fast threads. The first approach is ideal for single threaded applications, while the second approach excels in multi-threaded applications. It was never really confirmed nor was the extent of the multi-threading support in AMD’s upcoming cores known. So it appears that AMD’s upcoming K12 ARM core will be quite large for it support “many threads” instead of just supporting one additional thread as is the case with Intel’s high performance CPUs. 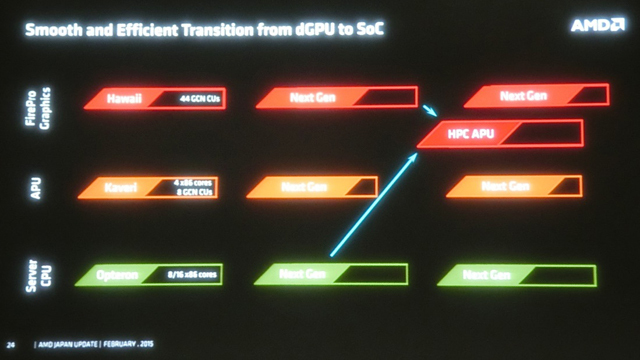 Moving on to GPUs, Hayashi revealed that AMD will be employing a two year cadence to updating its GPU architecture inside APUs. AMD will introduce Accelerated Processing Units with updated GPU architectures once every two years. It should be noted that this does not mean that AMD will only be introducing new graphics products every couple of years because that’s not the case. Discrete graphics cards will follow a faster cadence, this roadmap only serves to illustrate GPU architectures in relation to APUs. By 2017 AMD plans to introduce what it described as a High Performance Computing APU or HPC for short. This APU will carry a sizable TDP between 200 and 300 watts. This sort of APU, AMD expects, will excel in HPC applications. Similarly powerful APUs were not attempted up to this point because they were simply not viable due to the amount of memory bandwidth required to keep such a powerful APU fed. Thankfully however stacked HBM ( High Bandwidth Memory ) will make such designs not only possible but extremely effective as well. As the second generation of HBM is 9 times faster than GDDR5 memory and a whopping 128 times faster than DDR3 memory. Code names for future GPU architectures unfortunately were not revealed. But we did learn through a previous leak by our friends from Sweden that AMD’s upcoming GPU architecture to debut on 16nm FinFET will be code named Arctic Islands. We’ll get considerably more detailed CPU, APU and GPU roadmaps from AMD in May during the company’s scheduled Financial Analyst Day event, so stay tuned.